Join us for our 30th anniversary celebration! We will take a look back to honor all that we’ve achieved in the last three decades and share our vision for moving forward and all that we hope to achieve in the decades to come! 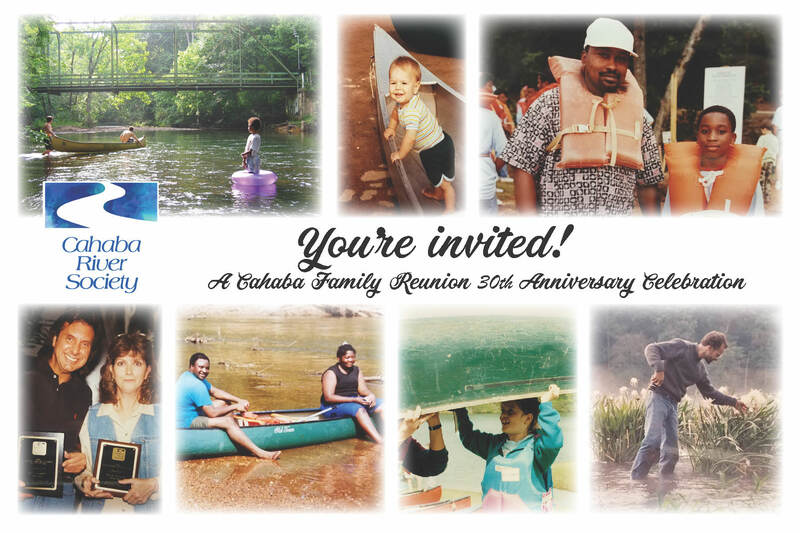 YOU are an important part of our history, and we need you to share your Cahaba memories! 1. Send us your Cahaba anniversary video like Beth’s clip above. 2. Send us your Cahaba photos. Contribute to the Cahaba Family Photo Album! Please share your favorite photos, both new and old, of you, your family and your friends on the Cahaba. Take a moment to scroll through the camera roll on your phone or dig through your hold scrap books and send us your #ThrowBackThursday Cahaba photos! Please email all photo and video contributions to Katie Shaddix at [email protected]. 3. Join us for a photo at the meeting! Have you been awarded a prestigious paddle or other Cahaba award? Please bring it with you and join us for a group photo at the meeting! Thank you for being a part of our Cahaba family! Please RSVP so that we will know to expect you!